Don't go on this show if you have a significant other in your life, basically. Every year when Strictly time rolls around, the more cruel of us wonder who shall be the victim of the ‘Strictly Curse’. It happens most years – paired with a buff dancer, many of the celebrity contestants find the chemistry from the dancefloor follows them off screen. The Curse has claimed many a relationship, yet some people (former Strictly pro Gleb Savchenko among them) refuse to believe it is real. Here’s a complete account of the times the Strictly Curse has struck, lest there be any doubt. The pairing that started this whole thing off – newsreader Natasha was partnered with Brendan way back on the first season in 2004, and when the pro split from his fiancée during the show, rumours flew that it was because of his feelings for Natasha. They’ve always insisted that there was no affair, but acknowledged the ‘chemistry’ between them. Oooh. Kristina was partnered with rugby player Ben Cohen for the 2013 series – a year later, he announced that he had split from his wife, and a year later AGAIN, revealed he was dating his former dance partner. They’re still together, and have a little girl, Mila. Pro dancer Flavia was dating a fellow dancer when the fifth series of Strictly began in 2007, but when she was paired with Eastenders actor Matt Di Angelo, it didn’t take too long for that dancer beau to disappear. They officially started dating after the series ended, and the relationship lasted for three years. But in reality, there wasn’t much drama. There was never a raised voice, and often the three of us would be sitting down having a cup of tea together. In 2010, weeks after announcing her split from Matt, Flavia revealed she was dating her new dance partner, Coronation Street actor Jimi. This has a happy ending, though – the couple married in 2013, and they’re still happy as Larry. This one probably really sealed the ‘Strictly curse’ for most people. Countdown’s Rachel Riley joined the show in 2013, just a year after she married her college sweetheart – she was paired with Pasha, and weeks after her elimination, announced her separation from her husband. The following summer, she began dating Pasha, and the pair are still together. Georgia here was dating her fellow Coronation Street actor Sean Ward when she joined the 13th series of Strictly in 2015, but viewers immediately noticed the chemistry between her and her dance partner Giovanni. Sure enough, Georgia split with Sean shortly after the show’s final, and a few weeks later confirmed that she was seeing Gio. They split up in 2016. Trying to start a new relationship at the same time was just too much. Strictly is the most intense thing I’ve ever done, as well as the best. …Kevin splitting up with his wife, fellow Strictly pro Karen, earlier this year. Karen joined the cast in 2012, with her husband following in 2014. I’m telling you, it’s a CURSE. …But they’ll still have to dance with each other this week. Yikes. 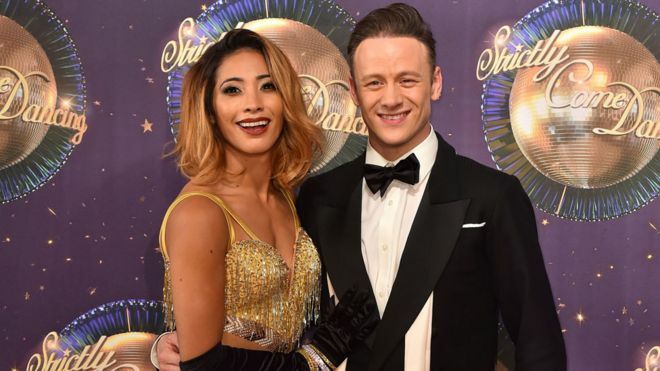 It’s safe to say the Strictly Curse is real, right? Very, very real.